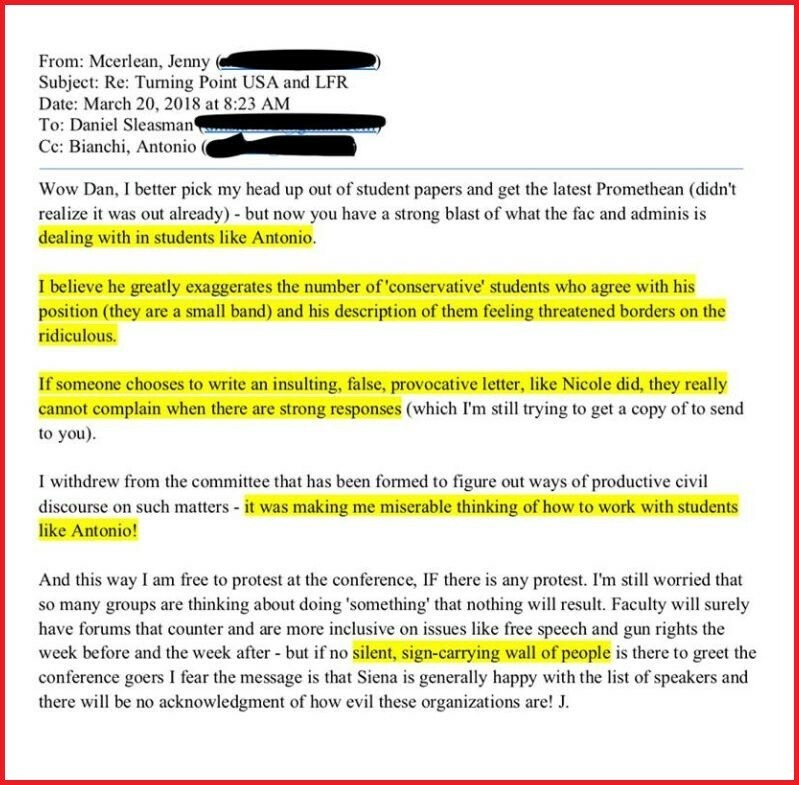 Zack Butler, a junior studying political science, posted 600 copies of an email from Professor Jennifer McErlean to an alumnus to express her animosity toward conservative students and her plans to protest a free speech event they are hosting. Conservative groups like Turning Point USA, which is organizing the conference, are “evil,” she wrote. Curiously, but not unpredictably, instead of reprimanding the teacher for her blatant prejudice and discriminatory language, the college served Butler with a “Notice of Charges,” claiming that his publication of the email message adversely affected “the health, welfare, and/or safety” of campus community members “or the name and/or reputation of the College” as well as violating the school’s posting policy. While Butler acknowledged his actions may have run counter to the school’s posting policy, he told The College Fix that being charged with adverse conduct was “what really bothered” him. He said the only reason he had decided to post the flyers was that the school authorities failed to respond to this incident or the broader climate of hostility against conservative students. “As a conservative student, I was bothered not only by the email but also the response, or lack there of, by the administration and felt something had to be done,” Butler said in a Facebook post. “I also thought it was ironic that they thought my posting of the flyers was more damaging to the reputation of the institution than the content of the email itself,” he added. Now, Butler faces possible expulsion or suspension, depending on how the college administration chooses to handle his case. The free speech conference that so upset Professor McErlean is titled “Let Freedom Ring” and will take place on Sunday, April 15, as planned. The event features prominent conservatives such as James O’Keefe, founder of Project Veritas; Christian Ragosta of the National Rifle Association; and author and conservative commentator Roger Stone. Her admission “it was making me miserable thinking of how to work with students like Antonio” makes her unfit to teach in a classroom. We have engendered a crop of whining liberal professors and our graduates will be forever damaged. Another example of the “Ivory Tower”, untouchable no matter how egregious. Christians can’t refuse to bake a cake…liberals can refrain conservatives ‘freedom of speech’ at Siena College. Conservatives money is good at this school, just not their views. Conservative might need to take their money and go someplace else.